The Liberia Partnership Summit organized by the Illinois Great Rivers Conference of the United Methodist Church gathered at Alton Main Street UMC Nov. 15-17. Bishop John G. Innis of Liberia praised the partners for the tremendous work they are accomplishing for the people of Liberia through the United Methodist Church. His commendation was contained in an evening message delivered at the Alton Main Street UMC on Friday, November 16, 2012. The Liberian church leader named the construction of schools, health centers, and the provision of safe drinking water to the people of Liberia as some other works that the partners are undertaking. “Your enthusiasm to organize and fully participate in this summit speaks volumes of how well meaning and intentional you are about the people of Liberia,” Bishop Innis said. “You have responded well to the call of Scripture by being your brothers and sisters keepers,” the Liberian church leader asserted. Bishop Innis further affirmed that the United Methodist Church of Liberia has been and is now contributing significantly to the reconstruction drive of the country. “There are now schools and health centers in the remotest villages of our country because of this partnership,” Bishop Innis declared. Discussing a major item of the summit’s agenda, the administrator of the Ganta Hospital, Victor Doolakeh Taryor, presented a $1.4 million (US) plan for the construction of the George W. Harley Regional Medical Center. Ganta United Methodist Hospital has operated in Nimba County on Liberia’s border with the Republic of Guinea since 1926. Other presentations included defined goals and objectives for the agriculture program, a priority list of training needs, coordination of efforts through the Liberia UMC website, regular updates through conference calls, and a renewed desire to continue our ministry together. Partners also called on UMC Liberia to upgrade its website in order to create a coordination center for all of the partners. The Liberia Partners Summit of 2012 ended with the Bishop Prince A. Taylor Youth Center as a targeted joint project for all interested churches and conferences. 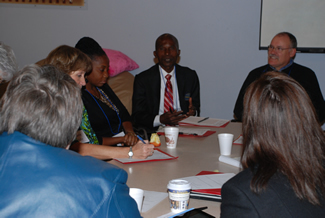 Tentative dates for the 2013 Liberia Partners Summit are Nov. 21-23 at Alton Main Street UMC. The summit ended Nov. 17 with several Liberians in the Diaspora playing a leading role. The morning devotion was led by Rev. Dr. Charles S. G. Boayue, II, Pastor of the Second Grace UMC in Detroit, Michigan and a closing Communion Service administered by Deacon Gifty Smith of the Trinity UMC in Flora, Illinois and member of the Bishop Keaton’s Task Force on IGRC Liberia Partnership. The United Methodist Church has been gathering in Liberia for worship since 1833. In all, 225,000 members worship in 554 churches from Harper to Greenville, Ganta to Buchanan. 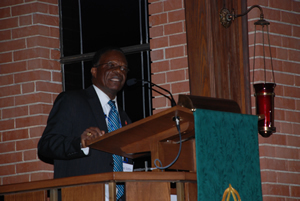 E. Julu Swen is director of communications for the Liberia Annual Conference of The United Methodist Church.